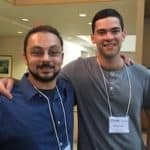 Eddie Samp joins Reuben Schuff at the 2016 annual convention of FRIENDS: The National Association of Young People Who Stutter. Mr. Samp discusses his lifelong struggle with “being okay with the way I speak” and how FRIENDS has become a second family. Eddie Samp is a 26 year old person who stutters, lives in Boston, and works in investment management. Eddie has been involved with FRIENDS since he was 7 years old. Mr. Samp returned this year to the FRIENDS convention to reconnect with friends and to give back support to the stuttering community.